A simple, handy and easy-to-use instant messaging program for local area networks. The program supports contact list, message archive, LAN browser. Compatible with WinPopup, Windows Messenger Service and net send. WinSent Messenger is an instant messaging program for local area networks. It will allow you to conveniently and instantaneously exchange short text messages with other users of your network, send and receive personal messages to and from them, send broadcast messages to a group of users or to all users of the network. - Does not require a dedicated server or an internet connection. 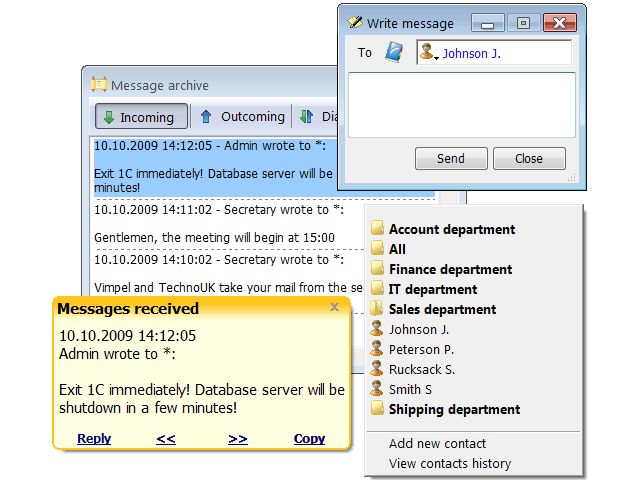 WinSent has simple, handy and easy-to-use user interface. It is a compact program with low system requirements. The program designed to be used in small or medium-sized office or home local networks.